Why were these two women hanging out together at the U.S. Senate, today? Hint: Julie Myers and Susan Collins weren’t together to discuss “Going for Goldfish,” the video produced by their British namesakes. And they weren’t hanging out in the girls’ room comparing notes on the latest men of ICE (Immigration and Customs Enforcement) calendar. No, Julie L. Myers and VERY liberal Republican U.S. Senator Susan Collins of Maine were discussing the men of the U.S. Senate and how to garner their votes for Myers. The meeting was mentioned in yesterday’s Congressional Quarterly. 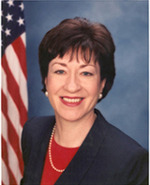 Collins heads the committee that oversees Myers’ nomination. They got together to plot ways to get the nomination of the unqualified Myers through committee and then to the Senate Floor for approval of her now-under-fire nomination for Assistant Secretary of Homeland Security over ICE. So what were they discussing? ICE agents are very worried. They speculate that Collins may try and “back door” Myers’ nomination out of committee without a vote and put her before the full Senate. That would almost assure her confirmation without the committee having to sign off on her. “If that is true, that is pretty scary,” said one worried ICE agent, echoing the sentiments of so many others from whom I’ve heard. Don’t let the Republican label fool you. Collins is very liberal and a feminist. She probably relishes the idea of an unqualified 36-year-old woman bossing around thousands of mostly male federal agents. There can be no other reason why she would not see to it that this unworthy nomination is DOA–where it belongs. Desperate ICE-Wives: Who is Julie Myers? I want a tuff looking guy to run ICE. Someone who has been to war and understands the problems our failed borders represesent. It’s shallow to judge someone by appearance, but she does not look like an experienced tuffguy to me for an incredibly difficult and high pressure job. Debbie you should really investigate Julie Meyers prosecutorial record. She was only an AUSA for less than 2yrs and never worked on anything more sophisticated than drug mule cases (where some poor fool swallows condoms filled w/Heroin to get past customs) – I know I worked down the hall from her. 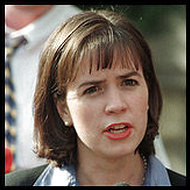 Julie is nice enough but she wasnt that hard a worker and certainly shouldnt be citing her stint as a Federal Prosecutor as giving her any relevant experience to run ICE. If she shows up on time and bathes twice a week, that is good enough for me. A Bull Conners wouldn’t help with the level of enforcement authorized now.